If you were to see the above 8 1/2" x 11" notice fully completed, dated and signed by the Region of York's Medical Officer of Health, Dr. Karim Kurji, in a restaurant window in York Region would you believe it is duly inspected and nothing was found? In most cases you would be right, but in one significant case, as Christopher Watts posted, you would be wrong. Chris found that Aurora restaurant, Aw Shucks!, had a shiny new Region of York inspection notice proudly displayed in the front window with a March 20th date of inspection. Yet, in a press release the Region of York outlines list of at 7 issues the Region's Health Inspector found at Aw Shucks that day and noted the restauraunt " fail[ed] to keep facility sanitary". The press release was picked up and reported on by Metroland's Aurora Banner which also mentioned several other restaurants as well. March 20, 2014 - 7 issues. April 11, 2012 - 11 issues. And yet during this entire time, not a word from the Region of York or news in the news media that health inspections were finding issues throughout these inspections. Even the Region of York was handing out the Green "Pass" notices similar to the one pictured above.
.@YorkRegionGovt so after all of these issues were noted by your health inspector, a press release, a green "everything is good" is allowed? Obviously the Region wanted to bury this embarrassing situation by having me call the 1-800 listed and speak to a media relations person who would give the traditional corporate marketing flap the Region Communications Department has approved to hand out. A list of 7 issues were listed! I'm still trying to figure out how this is reduced to "1 infraction". @MichaelSuddard @YorkRegionGovt so there is green and red, no yellow and red is only issued for pending closure? How is public best served? Christopher and I pointed out in the following tweets that any prospective customer walking by a restaurant was highly unlikely to visit Yorksafe.ca to see the health report. In fact, Yorksafe.ca is currently an inactive domain name and the Region's health inspections can be found at Yorksafe.com. 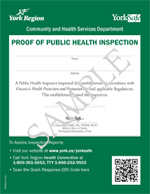 Most customers would assume that a duly posted sign showing "Pass" with the Region of York's Medical Officer of Health's signature certifying the restaurant had been duly inspected and found to have passed inspection would be safe to eat at. Christopher and I pointed out Toronto, Durham Region, Hamilton, and other jurisdictions use more than a pass or fail notice system to show results of restaurant health inspections. The Region failed to respond. Since then it is quite interesting that original Region of York's Official Press Release has dissapeared from their website entirely. As well the York's search function from it's main page doesn't show any results when the words "Ah Shucks" is entered. One has to dig into the Restaurant inspection section to find the results. Even then, the Region's York Safe search function has a searchable map that does not load properly after search terms are entered when using the world's most popular web browser, Google Chrome. The Region of York seems to be only interested in burying negative restaurant inspections deep in the unsearchable bowels of their website and not let the public know, unless absolutely necessary, of any health code violations found by their own salaried health inspector. In fact, the Region Communications Department will even go as far as removing the original press release after a couple of days online in order to ensure any health infractions are kept quiet. With the Region's Communications Department, only good news can be espoused while the bad news needs to be quickly buried or, ieven better, removed from the website. You can sure bet if Regional Council had not have passed the by-law requiring health reports be posted online, the Region's Communications team would have said "Ah Shucks!" and pulled down any inspection that resulted in an infraction faster than that March 24th press release. To that, diners, residents, taxpayers and voters should say to York Region Council: "Ah Yucks! its time to fix this or say sayonara in the 2014 municipal election!"